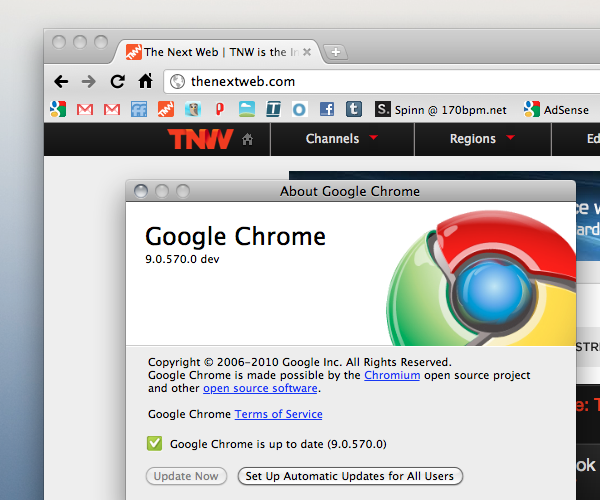 It was only a few days ago that we started to see the Canary release of Chrome 9 snooping around here on TNW. Now, taking Chrome’s typically quick pace in the Chromium Project releases, it’s available for download in the Dev channel. This developer preview channel is where ideas get tested (and sometimes fail). The Dev channel can be very unstable at times, and new features usually require some manual configuration to be enabled. Still, simply using Dev channel releases is an easy (practically zero-effort) way for anyone to help improve Google Chrome. What that means is that using the Dev channel release of 9 is a “buyer beware” sort of scenario. However, if you want to play with the latest somewhat-stable Chrome build, it’s available for public download and should be usable for the largest majority of its audience.